SONOR is proud to contribute their very best to the “Young Drummer Of The Year” contest and would like to thank Mike Dolbear and his team for the opportunity. We want all of the young and upcoming talents to experience only the best sound and quality on their journey, to express their musicality without boundaries. SONOR is one of the longest running company in the drum & percussion industry with a history dating back to 1875. Founded in Germany, the company has always strived for the best sounding instruments and perfection in craftsmanship. SONOR drums are played and loved around the world by some of the best artists, including Benny Greb, Chris Coleman, Gavin Harrison, Aaron Spears, Steve Smith, to name but a few. 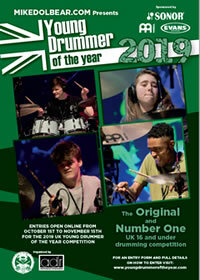 “Meinl is honoured to sponsor Mike’s Young Drummer of the Year contest again. I’ve been a fan of it for years and looking forward to offer my experience to young drummers who want to start a career in the drum industry. Really happy to be part of it again.